The new 12504 Wacker Neuson compact excavator is a 14 ton machine that has a tail swing console which is for flexible deployment in tight spaces. The compact excavator is the strongest machine in Wacker Neuson’s range and has a choice of three track types, steel rubber and hybrid. Despite weighing in at 14 Tons the dimensions are still compact and an excellent stability is offered through the optimal weight distribution of the machine. The Wacker Neuson compact excavator offers power and manoeuvrability as well as easy handling. The 12504 is not the only compact excavator in the range. 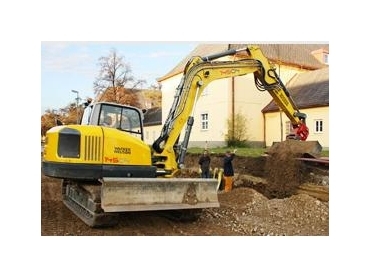 Wacker Neuson provide a wide range of excavators from 0.8 – 12 tons, with a total of 15 models available.